This traditional village pump house stands near the junction of the main Upton to Worcester Road and the road to Malvern Wells at Hanley Castle village. Some years ago it was restored by local residents, only to have the pump stolen shortly afterwards. It was fortunately soon replaced and the pump house gated. It now stands in testimony to the days before water supply was from a tap and very much taken for granted. If you are passing this way it is well worth a quick inspection. Take the Wells road and it is just a few yards down on the left. The pump is a grade II listed building and described by English Heritage as follows: Pump and pump house. Mid- to late C19. Painted brick and cast iron with tile roof. Rectangular plan. Entrance has round arch and iron gate. Bargeboards are shaped. The ridge tiles have end finials and pierced crestings. 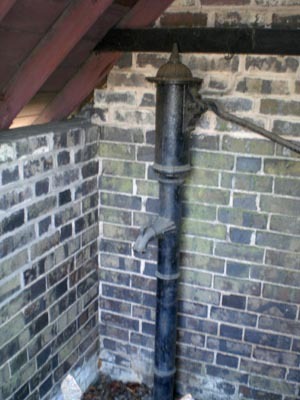 Interior: pump is of cast iron. Hanley Castle actually had a castle until the end of the 18th century. It was built by King John 1207-1212 and then extended by Edward 1. By the early 15th century it was an extensive, up to date facility with curtain walls and at least six towers. 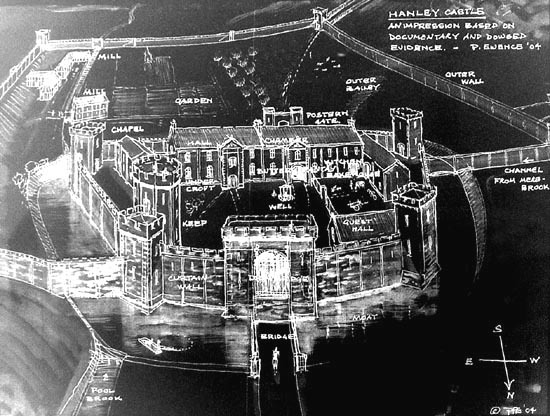 Shortly afterwards, during the Wars of the Roses, the civil wars fought in medieval England from 1455 to 1487, the castle was crumbling with neglect. Later it was quarried as a source of stone. Eventually it was the Hornyholds who finally demolished the last standing remains in 1795 to repair Upton Bridge. Part of the moat can still be traced near the church. The parish dates back much earlier. It was certainly in existence in the 10th century, when it included Hanley Swan and Malvern Wells. Further information: see Smith B (1946) History of Malvern.